Alocasia Kuching Mask PPAF. A few years ago we where fortunate enough to visited Borneo and stayed at a city named Kuching which means cat. After growing this Alocasia out we thought the long back lobes looked very similar to cats ears and gave it the name kuching. 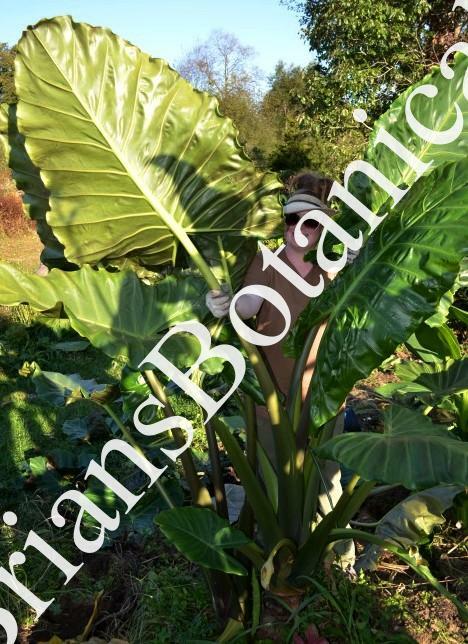 Alocasia Kuching PPAF grows to 8 feet tall with dark petioles and large spear shaped foliage. The top of the leaves are dark green with off white veins. The undersides of the leaves are dark maroon to gray in color with light green veins. The parents of this cross makes it an easy grower. Alocasia Kuching PPAf looks a little similar to our hybrid Alo. Mayan Mask PP24391 but on steroids.